Hi there! Did you have a good weekend? We've been busy little bunnies around here. We've got lots to tell ya, so let's hop right to it. First, we want to show you a little sneaky peeky of a wool applique pattern that will be available next week. It's something totally different and lots of fun! Next, we just got these two new Valdani 3 strand colorfast floss colors in the SHOP. We will have some new Fall projects coming in August so stay tuned. 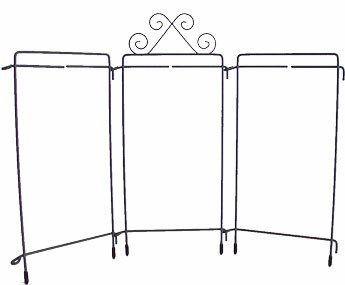 Oh and don't forget, if you need a table stand for upcoming projects, they have been marked down 15% in my SHOP. Next, David and I were actually away last week at his family reunion. 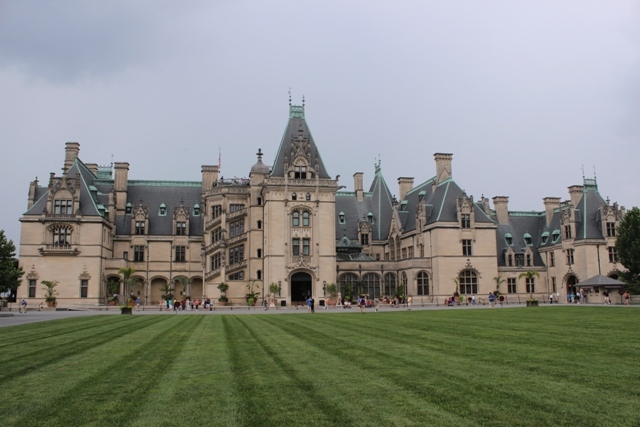 We went to Asheville, NC and visited the Biltmore Estate. All I can say is WOW!!! For all my friends in other countries, Biltmore is the largest privately owned home in the United States. It's the closest thing we have to a castle. It was built by George W. Vanderbilt and he offically took occupancy in 1895. He was a bachelor at the time! It's truly magnificant. 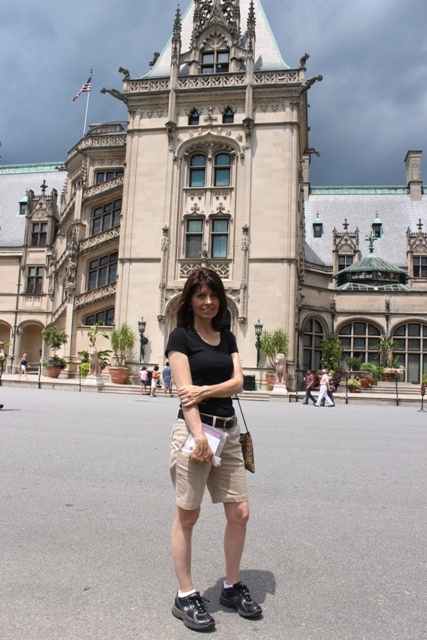 Me in front of Biltmore. Pay no attention to those white chicken legs. hee,hee,hee. I don't get outside much. 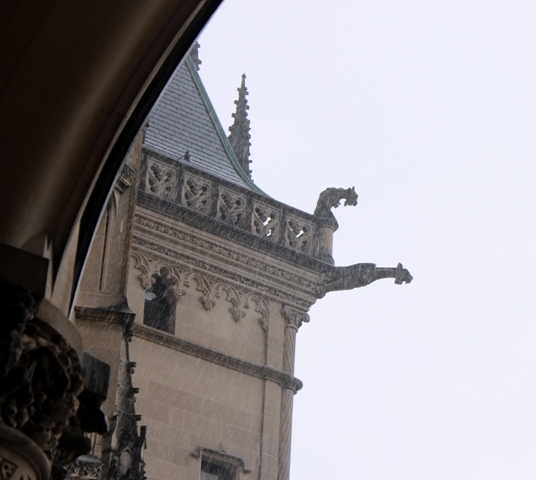 It started raining and David got this great photo of the gargoyles. They are all around the house and on the roof. I think they are so cool! Me and David with Biltmore in the background. They had lots of peeps swimming in the lake and all kinds of critters on the property. I loved it. Next, we want to remind you that the Think Christmas blog hop starts today! 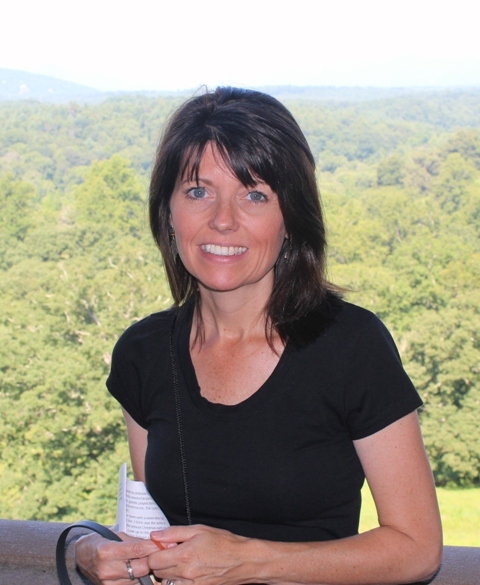 Hop over to Lesley's blog and get the master list of participants. Our day is Thursday and we have a fun project for you and a giveaway! Woo hoo! 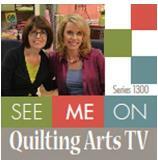 Finally, hop back on Wednesday and join Harrington and Hannah as they present our post for the Pet's on Quilts hop. We are a prize sponsor for this event and there are lots of wonderful prizes to be won! It's going to be a really fun week! We're looking forward to spending it with you! For Sale today is my original, one of a kind Folk Art Fusion piece called "The Royal Wedding." I was inspired by all the wedding festivities for William and Kate. It was such a magical and happy time. It measures 24" x 20" and was created using my Folk Art Fusion technique, which you can find in my book, Briarside Lane. This is one of a kind and signed by me. If you would like this piece of my original art, please email me. Cost is $125 plus $10 for shipping. I will ship anywhere in the world. First email get's first dibbs. This Thursday and Coming Next Week! Coming this Thursday at 12:00 noon. I will be offering one of my original Folk Art Fusion pieces for sale here on the blog. 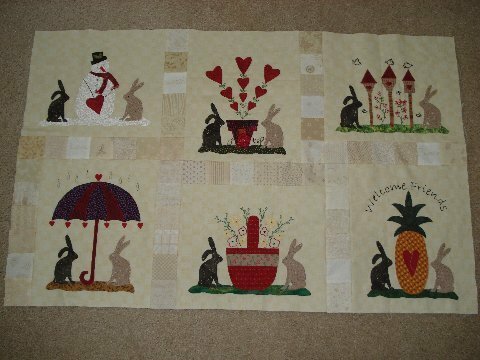 Many of you that follow my blog are not quilters, but like art and like bunny things. Hint, hint, hint. So hop back and visit us here Thursday at 12:00 noon eastern time. Here's a sneaky peeky. Just a couple of reminders for some fun events coming next week! First, starting Monday we have Think Christmas blog hop! I'll have a fun project for you to do and a giveaway! Woo hoo! 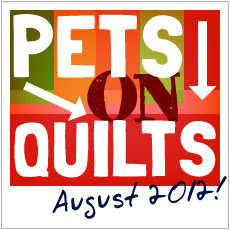 Then, on August 1st we start the Pet's on Quilts event. We are a prize sponsor so be sure to hop over and check it out. "What are you two chatting about over there?" "Us? Oh nothing. 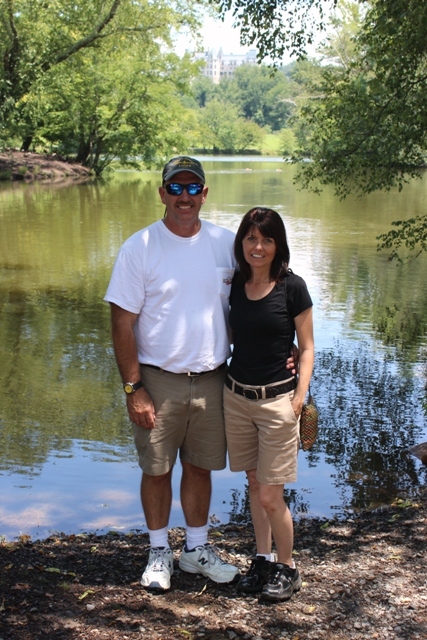 We're just standing here enjoying the day." "Yeah, don't don't pay any attention to us Mama. Get back to your work." "Ok, Hannah, let me know when she comes back." "Harrington! How many times have I told you NO NIBBLING on the furniture! You naughty little nibblers! Go sit in time out!" "Hannah you are a terrible look out." "Yeah well, you are a slow poke nibbler." Happy Wednesday! I've been working like crazy trying to get things organized here in Bunnyville. I just got some new shipments of wool in and I need to make room for all the gorgeous colors. I have some really fun new patterns coming next month, so stay tuned! Until then, I'm letting go of some things I no longer need, like these glass pearl beads. Some of them are 4mm, some are larger and some are smaller. There are also some clear glass seed beeds and more pearl beads that are not shown in this photo. Those are Swavorski. These are perfect for all my friends out there that like to make mixed media projects or crazy quilts with some bling. This is about $40.00 worth of beads. I'm selling them for $20 and that includes shipping anywhere in the world. (glass jars not included). If you would to purchase these beads, send me an email. First come, first dibbs. These are not in my shop. Ok...now back to inventory. Have a fun day! Did you know that honey bee's are disappearing because of problems in the environment? Without bee's, so much of our food will not grow. Mother nature created a beautiful design for for things to work together and when we humans do things to destroy that design, it can affect the future and the lives of those we love. So, in honor of the bee's who's hard work bring us a bounty of food, Harrington and Hannah want you to remember that "You should always bee sweet to your honey." We also want to send a huge thank you to everyone that grows organic vegetables as we truly enjoy eating them. We are willing to pay a little extra money for a bounty that blesses the earth and doesn't promote destruction. Hop over to our SHOP to get this month's pattern. If you are just joining us, we have National Nonwoves wool, Valdani 3 strand floss and fabric kits available. Don't forget to join the Flickr group too! Following the link on the right sidebar. 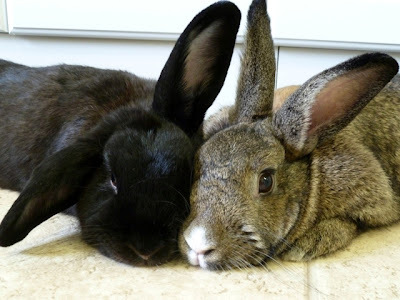 "We'd like two large salads with the 5 lettuce mix, some of your best timothy hay pellets, a bowl of your finest filtered water, oh, and a side of those freeze dried, natural banana chips." "Waitress! Oh Waitress! What seems to be the delay? We've been waiting for over three minutes!" "She is so not getting a tip." Sorry bunnies. Mama is just busy as all get out designing new patterns and packaging orders from her book. In fact, here's a sneaky peaky of the next block in "The Adventures of Harrington and Hannah." It will be here this Sunday in our Shop! How have you been doing with your blocks? I received a delightful email from Launa in California. She doesn't have a blog, but sent me a photo of her blocks so far. Don't they look wonderful! Thank you for sharing them Launa! Keep up the beautiful work! Happy Friday and see you Sunday! For all of our new friends and followers and for all of you that may have missed this tutorial a few months ago, I decided to post it again. Lately I have been designing wool applique patterns and thought you might enjoy a fun little tutorial. I am a penny "pincher," but this is called penny "pitcher." hee,hee,hee. I crack myself up! I truly love a warm country look in my home and wanted to make something that I could hang from a peg hook or a doorknob in the kitchen to add a little color and fun. This project would also make a great gift. You could add a card and some flower seeds or candy or whatever you like. So let's get hopp'in with our Penny Pitcher! First you need some wool felt. I have these kits in my SHOP along with many other supplies and patterns. You will also need some fusible web. I am the queen of using fusible web! LOOOOOOOOVE IT! Ok...sorry about that. I get carried away sometimes. 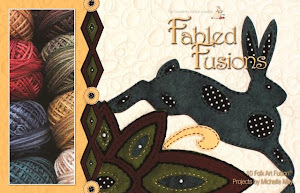 Trace the pattern pieces onto the fusible web. Like I said, I'm a penny pincher, so I'm pretty stingy with my fusible web. I try not to waste any of it so I trace smaller pieces into larger areas. This is how I cut them out. Now fuse the pieces to the wool felt. There really isn't a wrong or right side to the wool felt. I usually just pick a side. Once you have fused the pieces down, cut them out on the pencil line. 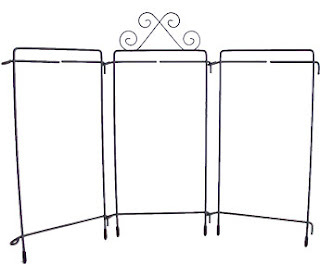 You will need two 5 3/4" x 9" pieces of black wool for the background. You also need a 3/4" x 2 3/4" piece of yellow wool and a 5 3/4" x 1" piece of orange wool. These sizes are all listed on the layout page for your convenience. Using the layout page as a guide, fuse the pieces in place onto one of the background pieces. Oooo...pretty! Now you need some floss. I'm a designer with Valdani Threads and I Looooooooove their 3 Strand, handoverdyed, colorfast floss. These are the colors I used for this project. Kits are in my SHOP. Now add some decorative stitching to your applique. I like using a running stitch as I like a simple, primitive look. If you like a blanket stitch, then you could use that. Whatever makes you happy! :) I also used 1/4" buttons inside my flowers. When stitching the orange strip, don't stitch the sides or the bottom just yet. Now you'll need some freezer paper for this part. Trace 4 penny flaps onto the dull side of the freezer paper. Then fold a piece of black felt in half. Line the top of the freezer paper flaps up on the fold of the felt. Now cut your flaps out on the pencil lines. Next, fuse the stars to the flaps keeping them closer to the bottom as the top of the flap will be sewn inside the background pieces. Make simple stitches around the star to hold in place and add a button. Then fold the flap over and stitch together around the edge. Whip stitch the penny flaps to the back of the appliqued piece being sure to line them all up. Pin the remaining 5 3/4" x 9" piece of black wool to the appliqued piece. Now stitch the sides and bottom of the orange strip securing the front and back wool pieces together. And then stitch down the sides leaving the top open. Again, use whatever stitch you like. Add a piece of wire for hanging. You could also use some jute, ribbon, or yarn if you don't have wire. Finally, fill your little Penny Pitcher with flowers, a card, candy or whatever you like and you're done! Wasn't that fast and fun? Here are the links to the pattern layout and the pieces. Red, White and Blue Mini Quilt Winner!